Home › Category: Biology › What is Pinocytosis? Pinocytosis is a cellular process by which fluids and nutrients are ingested by cells. Also called cell drinking, pinocytosis is a type of endocytosis that involves the inward folding of the cell membrane (plasma membrane) and the formation of membrane-bound, fluid-filled vesicles. These vesicles transport extracellular fluid and dissolved molecules (salts, sugars, etc.) across cells or deposit them in the cytoplasm. Pinocytosis, sometimes referred to as fluid-phase endocytosis, is a continual process that occurs in most cells and a non-specific means of internalizing fluid and dissolved nutrients. Since pinocytosis involves the removal of portions of the cell membrane in the formation of vesicles, this material must be replaced in order for a cell to maintain its size. Membrane material is returned to the membrane surface through exocytosis. Endocytotic and exocytotic processes are regulated and balanced in order to ensure that a cell’s size remains relatively constant. The receptor-mediated endocytotic pathway is commonly associated with regions of the plasma membrane that contain clatherine-coated pits. These are areas that are covered (on the side of the membrane facing the cytoplasm) with the protein clatherine. Once the target molecules bind to specific receptors on the membrane surface, the molecule-receptor complexes migrate toward and accumulate in clatherine-coated pits. 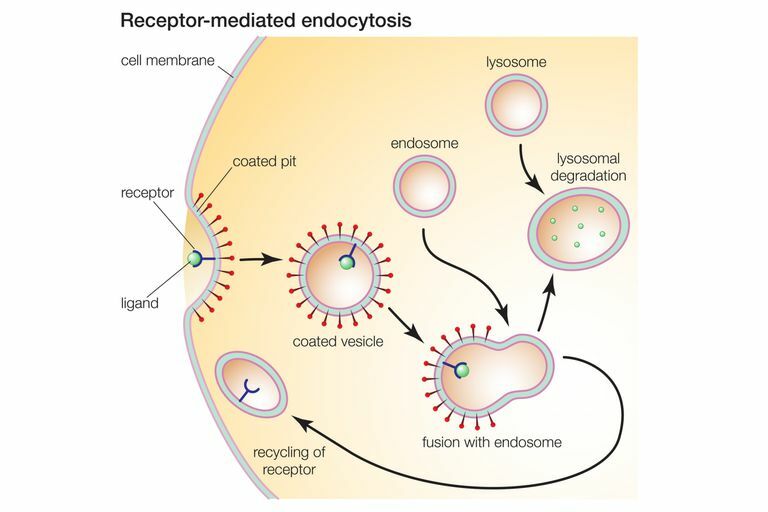 The pit regions invaginate and are internalized by endocytosis. Once internalized, the newly formed clatherine-coated vesicles, containing fluid and desired ligands, migrate through the cytoplasm and fuse with early endosomes (membrane-bound sacs that help sort internalized material). The clatherine coating is removed and the vesicle’s contents are directed toward their appropriate destinations. Substances acquired by receptor-mediated processes include iron, cholesterol, antigens, and pathogens.